Real American as Apple Pie? Having moved to Virginia, I’ve really moved for the first time- I even have a Virgina license and everything. I’m registered to vote. And while I’m not really sure if I’m really a Virginian yet, it turns out I don’t actually have to worry about whether I think I am or not. My task was clear. In order to become a “real American,” I had to make an apple pile. My mother doesn’t like to bake– She will make a boxed cake for birthdays, but when it comes to measuring out ingredients, she just doesn’t care for it. But she does make pie. Almost always apple, but occasionally blueberry. And while I’ve made lots of cookies, cakes, and other baked goods, pie was always my mother’s thing. At college, pie was taken over by Em(and occasionally others), and so I still hadn’t really done much with it. But I had half a peck of apples, and a whole wheat pie crust from Whole Foods….. I ignored her crust instructions, because Em wasn’t there to yell at me. Also, I figured I would perfect one aspect before I moved on. Oh, and I’m not a huge crust enthusiast in the first place– most of the reason I picked a streusel topping. Before you turn on the oven: Put foil on the bottom, underneath the heating element. You’re also going to want to put the pie on a baking sheet, and line the sheet with foil or parchment. If you’re worried about the bottom of your crust, you could just put the baking sheet on the rack below the pie. Pies create juice, and they like to share it. You might assume that you will be lucky, but it’s unlikely. 4 tablespoons unsalted butter, softened — I used margarine. 4 pounds mixed Granny Smith, Golden Delicious, and Empire apples (about 8 medium)– I used Macintoshes. And I probably used 7. Make the topping: In a small bowl with your fingertips blend butter, brown sugar, and flour until smooth and blend in nuts. Chill topping, covered. Make the filling: Peel and core apples. Cut apples into 1/2-inch wedges and in a bowl toss with remaining filling ingredients to coat. Spoon filling into shell and fold pastry overhang over filling, leaving center uncovered. Bake pie in middle of oven for 1 hour (pie will not be completely cooked) and remove from oven. 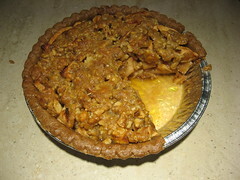 Crumble topping over center of pie, breaking up any large chunks. Bake pie in middle of oven 30 minutes more, or until crust is golden and filling is bubbling. Cool pie on a rack. And, just for the record, Scranton is not in southeastern PA.
Also, that woman’s smile is kind of scary. I’m going to make an apple pie today. I’m trying an oil crust and am rather dubious about what dish I’m going to cook it it, and haven’t yet decided which bottle is going to serve as a rolling pin, but I’m going to make a pie (also, a stromboli and asparagus with almonds).